With the frenzy spreading like a wildfire through Brazil, the Olympic fever truly descended upon Rio. The second day of the games had a lot to live up to, but it delivered. Including the first appearance of Michael Phelps, and so many world records, we recap the highlights of the day from all sports below. 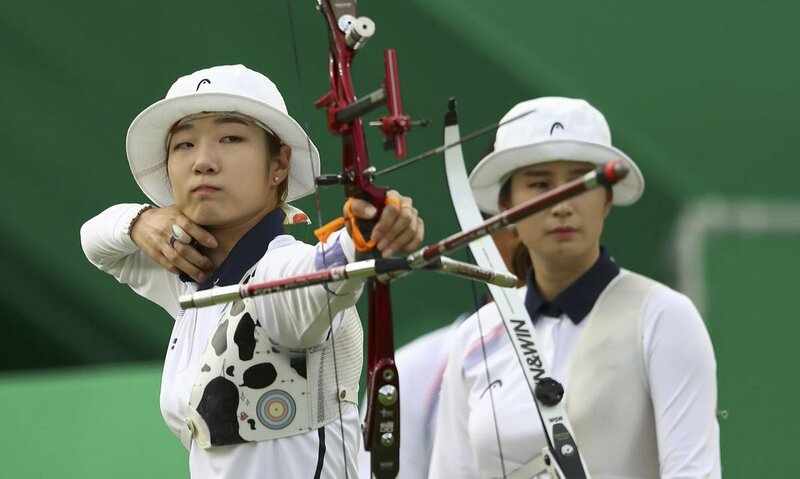 South Korea's women followed up the success of the men's team as they proved unstoppable in the team competition. They defeated Russia in comfortable fashion, a 5-1 scoreline giving them their eighth consecutive gold medal in the event. Taiwan, officially referred to as Chinese Taipei, finished third placed after defeating Italy 5-3 in the bronze medal match. The United States' women's basketball team dismantled Senegal with a 121-56 thumping as they scored their highest total and biggest win margin in the games. In one of the more riveting games on the day, Croatia edged Spain by a mere two points to make a surprise statement of intent in the men's basketball action. Day 2 featured the round of 32 bouts for fighters from the lightweight, welterweight and light heavyweight divisions. Team GB's Joshua Buatsi was the star of the Light Heavyweight action, blasting out Kennedy Katende en route to a third round stoppage. 2012 Olympic medalists Andrei Zamkovoi edged Rayton Nduku Okwiri in a hard-fought split decision in the 69kg welterweight category. Germany's Sideris Tasiadis' second run in the mens' canoe single helps him to first-placed in the qualification, with a time of 92.23 seconds. Anna van der Breggen snatched a gold medal late on in a thrilling women's cycling road race which went down to the wire through the picturesque setting of Rio. After controversy over missed drug tests, Team GB's Lizzie Armitstead finished fifth, and was unable to keep the pace and fell towards the chasing pack as she failed to defend her Olympic crown. Annemiek van Vleuten suffered a terrible crash late on in a descent, causing concern around the event area. The Dutch cycling federation would soon inform that she was communicating in hospital. China walked away with the gold medal from the women's synchronised 3m springboard as Wu Minxia solidified herself as diving's best female Olympian, teaming up with Shi Tingmao in a performance scoring 345.60. Italy finished in second place with a total 31.77 points less than the event winners, with Team GB failing to secure a medal as they went back to the drawing board. William Fox-Pitt continued his run towards long-awaited Olympic silverware as he once again topped the standings in the individual eventing. Christopher Burton of Australia remains hot on his heels however, with just 4.9 penalties separating the top 10 places. In the team dressage, Germany have a slender 0.2 difference between themselves and France, while the USA looked to begin rallying with a 4-star performance from Phillip Dutton. Italy's Daniele Garozzo defeated Alexander Massialas to win the men's foil individual competition, pulling off a huge upset against the top-ranked competitor who himself had to make a huge comeback to reach the semis. There was no luck for Team GB, as Richard Kruse fell short in the semis and then his comeback was narrow of getting bronze against Timur Safin in another thrilling battle. After stunning the reigning champions in the first half, Fij would find themselves on the receiving end of a mauling by Mexico as they fired five in the second half. Serge Gnabry rescued a point for Germany, while Argentina just got by a tough Algerian side as part of the rest of the fixtures. 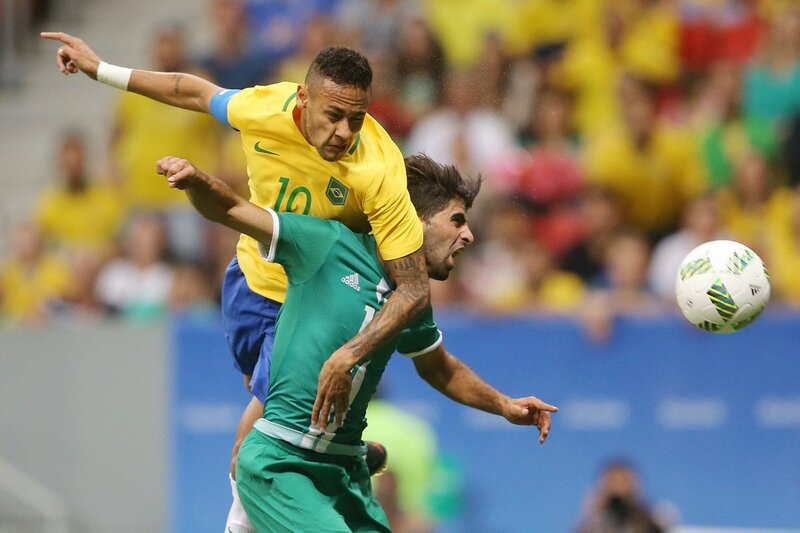 It was a frustrating evening for Brazil who again failed to score, this time against a resilient Iraq with Neymar left frustrated at the end of it all. The United States' gymnastics team cruised through qualifying, finishing the day with a 9.959 point lead, with Simone Bile leading the show as they showed how far ahead they truly are. Great Britain, meanwhile, overcame a few obstacles to qualify for the final after Ellie Downie injured her neck in a fall. The men's handball ties contested over group A and group B were, for the most part, very closely contested affairs. Argentina, having helped tennis player Del Potro who was stuck on an elevator, would eventually succumb to the skills of Denmark. Qatar's strides for handball dominance continued as they beat Croatia 30-23, while Germany and Brazil just got past Sweden and Poland respectively. In the women's hockey, New Zealand decimated South Korea, while Netherlands were even more impressive against Spain. China and Germany shared the spoils as did Japan and India. Great Britain and New Zealand drew in the men's, with goals from David Condon and Barry Middleton as the pressure was on to vindicate their opening round losses. Olympic debutants Kosov were handed their first medal as Majlinda Kelmendi won the female 52kg tournament, ousting Odette Giuffrida in a rather tepid final where she scored early then managed to hold on and ride a fine line with referee cautions. Fabio Basile stunned An Baul of South Korea in the mens' 66kg contest, with an emphatic Ippon in the final to bring more gold home for the Italians. High winds at the Lagoa Stadium delayed then postponed the rowing events with officials not willing to risk the circumstances that lead to the capsizing of a Serbian bout just 24 hours prior. With very open waters, there are concerns that this may become a more frequent occurrence. Team GB progressed to the semi-finals as they hammered previously unbeaten Canada and cruised past Fiji. Scoring 15 seconds in with Abbie Brown, they held up the pace to win 26-7 in the quarter final. Australia flew past Spain, where they will meet Canada in the semi-finals. Making up the top four were New Zealand. Olympic heavyweights China found another gold in shooting as Mengxue Zhang triumphed in the women's 10m air pistol. She held her nerve throughout, and just raced ahead of the pack with no one able to catch up. In the trap event, Catherine Skinner of Australia outlasted Natalie Rooney in an Oceanic final affair. She nailed the final shot as did Rooney, but the 12-11 scoreline favoured the Aussie. Sarah Sjostrom set a new world record as she claimed a gold medal for Sweden in the women's 100m butterfly. 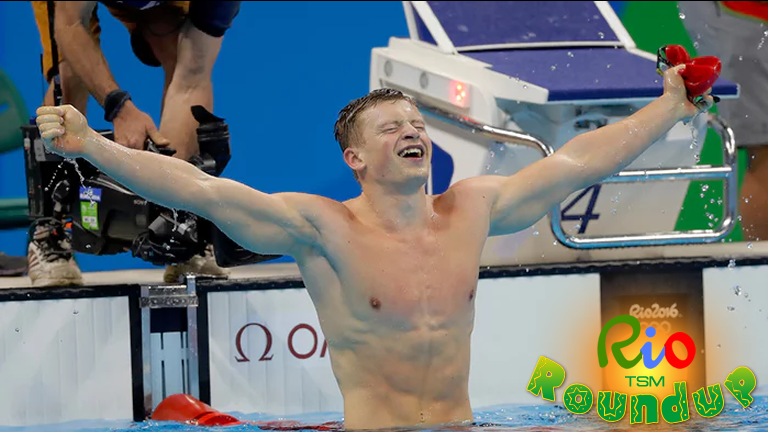 Adam Peaty gave Great Britain their first medal at Rio 2016 and yet again broke his own world record in the men's 100m breaststroke. Katie Ledecky also broke a world record, in fact smashed it, with a sensational performance at the women's 400m individual medly final. She was way ahead by the time she closed in on the finishing line while Team GB claimed Silver with Jazz Carlin. 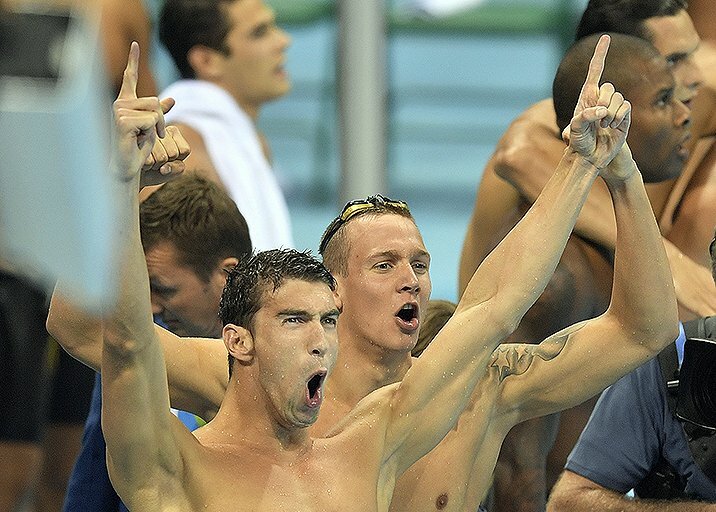 Michael Phelps' first appearance in the summer games was worth the wait as he made the difference in the mens' 4x100m relay to bring the USA another medal. He was in at second and changed the whole complexion of the contest. Great Britain saw both Liam Pitchford and Paul Drinkhall progress onwards from the second round, while in the third which started later in the evening was started with China's Ma Long winning the first game. The hosts' Hugo Calderano also made it through. In the women's action, France’s Xue Li was the only athlete to sweep in the second round, before moving on to the fourth along with Chinese and South Korean players. Andy Murray managed to get through in his first singles game quite comfortably to begin the defence of his Olympic title. However, there wasn't much fortune in store for when he took to the court hours later for the doubles alongside brother Jamie. They lost out to Brazilian pair Bellucci and Sa after countless attempts to save the match on a nail-biting tie break. Serena Williams moved on in the singles, but for the first time ever, her and her sister lost as a doubles team in the Olympics. Part of a host of shocks on day 2 at the courts, they lost out to he Czech pairing of Lucie Safarova and Barbora Strycova. 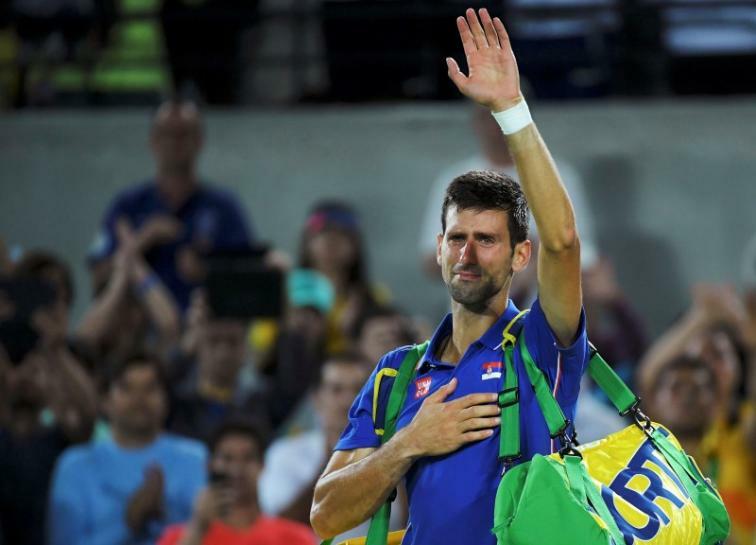 World number one Novak Djokovic was stunned in the first round at the hands of Juan Martín del Potro - who was stuck in an elevator for close to an hour on the same day as his match. It clearly didn't deter him though, as he fought hard for every point and reaped the rewards. Rafael Nadal started his busy tennis schedule at the Olympics with a win over Argentina's Federico Delbonis. United States fell to Canada while Brazil and Italy were among the victors in the men's volleyball preliminary. As for the women, both of the hosts' beach duo held their nerve to pick up victories. China's Long Qingquan prevailed in the dramatic men's 56kg contest, breaking the world record in the process as he topped Yun Chol Om. Three Olympic records were broken over a crazy three minute period, but the Chinese weightlifter secured the gold medal with a 170kg lift. In the women's 53kg, Shu-Ching Hsu of Taiwan broke an Olympic record with 12kg separating her and silver medalist Hidilyn Diaz.